Welcome to the Dalston Drama Society website. The Society was originally founded in 1946 and enjoyed putting on productions until 1966. After a break of 14 years the society reformed in 1980 and is still running today. Generally the Society performs two plays each year one in March and one in November. 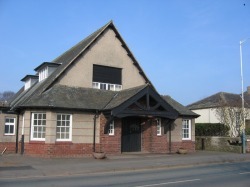 The plays take part in the Victory Hall in Dalston near Carlisle. The Society has no formal membership and is happy to welcome new people at any time, whether they are actors or prefer to stay behind the scenes.